Little has changed at Pennard Golf Club in Wales since it was established in the 19th century. It's one of Wales' most shocking golf courses and a favorite of the game's purists. 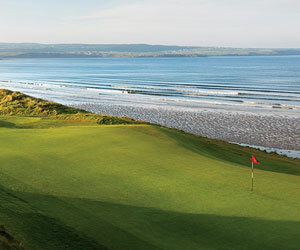 Architect Tom Doak puts it among his five best undiscovered links courses in the British Isles. It's rugged and quirky with a fairway that's barely defined in most spots, and free-range animals have been known to make their way onto the course from time to time. The par-5 16th hole is an incredibly beautiful sight, overlooking the rocky sea well below. It's a big reason why Pennard has been dubbed the "links in the sky". Pennard GC: "Links in the sky"
Pennard Golf Club in Wales is nicknamed "Links in the sky". The fairways at Pennard Golf Club in Wales are rugged and uneven mostly. The par-3 12th at Pennard Golf Club in Wales. Pennard Golf Club overlooks a valley and old castle ruin. Pennard Golf Club: historic links in South Wales. A shot of the old castle from the back nine at Pennard Golf Club in Wales. A view of the sea from the back nine at Pennard Golf Club. The par-5 16th hole has the best views at Pennard Golf Club. The 17th is the second of two back-to-back par 5s at Pennard Golf Club. The par 4 18th at Pennard Golf Club.